Justin Timberlake is headlining Pilgrimage Music & Cultural Festival in Franklin this weekend, and will probably further prove that he can do anything and be better at it than the rest of us mere mortals. If JT’s music is your thing, but you’re not sure that Americana or country music is, don’t worry. Dawson hits those delicious high notes with ease just like Justin, and his voice has the same easy, smooth delivery. “All On Me” has a laid back pop sound to it that JT fans crave. The “cool guy/leather jacket wearing/urban looking” vibe is also shared between these two. Sam Hunt has long been identified as a country crossover artist, but it’s particularly obvious on this tour version of “Ex To See.” Production-wise, it’s pretty intense and sprinkled with EDM, and the dominant beat totally gives off “What Goes Around…/…Comes Around” vibes. Paging JT and Sam Hunt – mashup please? Cool, modern production is a huge part of Justin Timberlake’s music, and Florida Georgia Line’s latest album Dig Your Roots focuses on that same concept. 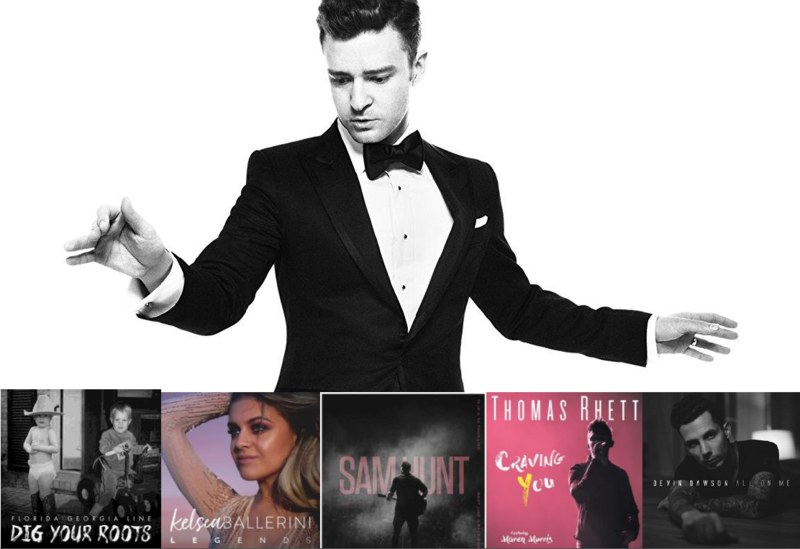 “Heatwave” is the top production achievement of the album, with layers and layers of incredible tracks that will intrigue Timberlake’s fans. It also has that R&B feel that JT does so well.